^ Wu JM, Wechter ME, Geller EJ, Nguyen TV, Visco AG. Hysterectomy rates in the United States, 2003. Obstet Gynecol. 2007, 110 (5): 1091–5. PMID 17978124. doi:10.1097/01.AOG.0000285997.38553.4b. ^ Masters, Coco. 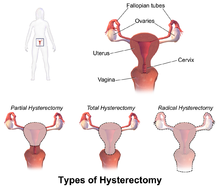 Are Hysterectomies Too Common?. TIME Magazine. 2006-07-01 [2007-07-17]. ^ Bahamondes L, Bahamondes MV, Monteiro I. Levonorgestrel-releasing intrauterine system: uses and controversies. Expert Review of Medical Devices. 2008, 5 (4): 437–445. PMID 18573044. doi:10.1586/17434440.5.4.437. ^ 4.0 4.1 4.2 The National Women's Health Information Center. Hysterectomy Frequently Asked Questions. Washington, DC: Office of Women's Health, United States Department of Health and Human Services. 2009-12-15 [2011-03-10]. （原始内容存档于2011-03-05）. ^ Knutsen, S. F. Lifestyle and the use of health services.. The American Journal of Clinical Nutrition. 1994-05-01, 59 (5): 1171S–1175S. ISSN 0002-9165. PMID 8172119 （英语）.